I was wondering if there has ever been an article done on building and testing the independent electronic boost controller (IEBC)? If not, do you have future plans to do some testing on it? We have not yet covered the assembly, fitment and tuning of the IEBC – but we have such an article planned to appear in a couple of months. WRX + DFA = Bang? Did Michael Knowling blow up the engine in his WRX using the DFA? I’m not for a minute suggesting it was the DFA's fault (it's all in the tuning), but can you tell me how it happened, how easy it was and what to look out for and to avoid before I get stuck into mine? Were you monitoring the mixtures? Michael has never blown up a WRX engine. A couple of years ago he purchased a ’94 WRX with a hole in an exhaust valve and dropped in a Japanese-spec replacement motor. This all happened before the DFA was conceived. 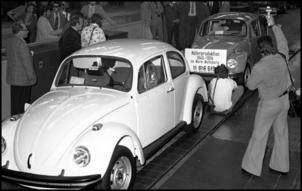 The Beetle was in full production until early '97 in Brazil. It remained a popular car as it could be bought (new) for a price well bellow most second hand cars and saw a number of little features like CD player and retrofitted dash. It was also available with an alcohol powered engine. It was a popular underpinning for a number of sporting vehicles, such as the Brazilian sports cars known as the Puma and Targa. These cars boasted the Beetle/Karman Ghia chassis and had bigger Kombi/Beetle engines of 1800cc, 2000cc and 2200cc (the 1800cc available in the European market Beetle from memory). Thanks for that – article now fixed. I am just wondering where you take new cars for your performance tests? Do you have a designated track you use or does it all involve a back road somewhere? If you use a track, do you get discount rates for using it often for the reviews? How long is each car reviewed before you come up with your conclusion and article? And last, but not least, do your reviewers have any formal qualifications? The manufacturer-supplied press vehicles that we test are typically sampled for a week. In some cases, we hire the vehicles for a similar length of time. The vehicles are driven in as many different conditions as possible during this week. Our 0 – 100 km/h performance tests are conducted on, as you say, back roads – somewhere quiet and safe. At age 29, Michael Knowling has spent the majority of his working life as an automotive journalist. He began writing articles on a part-time freelance basis in 1995. These articles were successfully published in some of Australia’s leading automotive magazines, such as Fast Fours and Zoom. In 1998, he decided to pursue a full-time career in motoring journalism and was employed by AutoSpeed. Initially, Michael contributed two articles per week but in 2003 he moved to a lead journalist position, contributing four full-length feature articles each week. He has written approximately 100 new car road tests and has driven a diverse range of vehicles. He currently performs at least three in-depth road tests each month and prides himself on having a broad appreciation of vehicles, having owned a selection of European, Japanese and Australian vehicles. Michael's other employment background comprises an administrative traineeship and project assistant within the South Australian State Government. He also attended Business College as part of his Government traineeship. After completing Year 12 in 1993 he has also undertaken courses in electronic engineering, marine navigation, seamanship, radio communications and public speaking. Julian Edgar, 41, has worked as a senior secondary school teacher, journalist, editor, author and photographer. At 20 he began successfully contributing freelance stories and photographs to Australian photography magazines. He then taught adult photography classes with the Workers’ Education Association and at an Aboriginal Community College. In 1985 he graduated with a Diploma in Teaching (Secondary) and a Bachelor of Education (double majors: Geography and Sociology) from the University of South Australia. He then worked as a senior secondary school teacher for 8 years, teaching Year 12 Geography and Natural Resources Management for the Education Department of South Australia. During this period he successfully undertook post-trade automotive subjects in engine management, front-end and suspension, air conditioning, automatic transmissions and electronic ignition systems. In 1990 he started freelancing for automotive magazines, subsequently having material published in Australia, the US and the UK. He turned to full-time automotive writing in 1995. He was founding editor of Australian modified car magazine Zoom (1996) and founding editor of AutoSpeed (1998). He has been the automotive technology contributor to electronics magazine Silicon Chip since 1992 and is also currently a major contributor to AutoSpeed. His 350-page book on modifying high technology cars, 21st Century Performance, was published in 2000. His co-authored book, High Performance Electronics for Cars, was published in 2005. At the end of 2004 he was awarded a Graduate Diploma in Journalism from the University of Southern Queensland. He is an affiliate member of the Society of Automotive Engineers (Australia), Society of Automotive Engineers (International), and the Institute of Automotive and Mechanical Engineers (Australia). Just a simple question... In your article 'Going Motorsporting – Part Two” (Going Motorsporting - Part 2) there is a blue car at the bottom of the page. What sort of car is it? Excellent site! 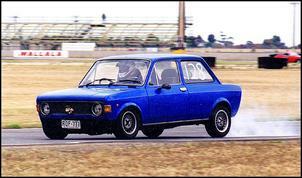 A Fiat 128 2 door – something different! Do I have to own the car for 12 months or can I store it for 9 more months and then bring it back - or? I have a 1996 Hyundai Accent. I have also recently bought a new 1500cc non-turbo Hyundai engine to modify and transplant it into the Accent (which is 1300cc at the moment). Would you be able to give me some pointers on how to join a turbo onto my existing manifold? The problem is there is a dirty great cat converter in the way - any ideas on what to do? I have started looking into Mitsubishi Delica Exceeds and other imported people movers (such as Estimas and Hi-Ace Super Customs) and haven't had the best response from insurance companies. Most claim them to be a high risk and will only cover them for 3rd party. I guess it's due to lack of parts - if you were to crash the front-end of a Delica, gaining suspension/brake or driveline parts would be difficult. Any ideas and advice on who would insure them? 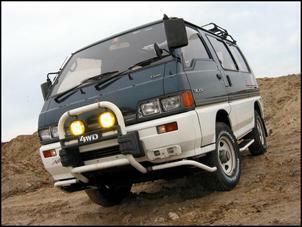 Some parts would be hard to come by, but the many Delica parts are the same as the local 4WD Express from the same era. As ever, we suggest contacting as many insurance companies possible – coverage and premiums vary hugely! Interesting re Odyssey – maybe the second-hand price of the previous generation V6-powered Odyssey will go up. 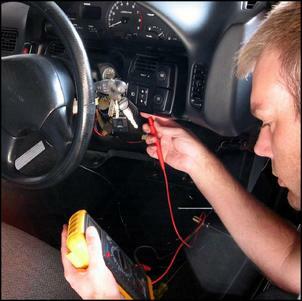 I was reading your “Steal Stopping” article on installing an immobiliser (Steal Stopping - Part Two) and I am trying to install an off-the-shelf immobiliser into my Nissan S13 Silvia. Now I have no idea where to connect it. I’m not asking for a stack of advice, I just need to know where you got a wiring diagram from? I'd even be willing to purchase it - was it in the service manual? Check out www.nissansilvia.com/forums for a link to the service manual.